Reload Internet is the best passport photo studio in London for you to have your Romanian passport photo or visa photo taken and printed at – we are the most convenient studio in London due to our location in Paddington, and our friendly, experienced staff will ensure your photo meets all the necessary regulations set by the Romanian Embassy in regards to passport and visa photographs. Our store is open 7 days a week in Paddington, from early in the morning until late in the evening, so you can come and visit us at a time that suits you. The whole process takes just 10 minutes, and you don’t need an appointment, so you can pop in whenever you’re free to have your Romanian passport photo or visa photo taken. We’ll even print your photos out for you right there and then! Our quick service that comes with a guarantee to pass at the Embassy cannot be beaten. Our staff will use the latest in printing and camera technology to provide you with a set of 6 photographs for just £9.99. 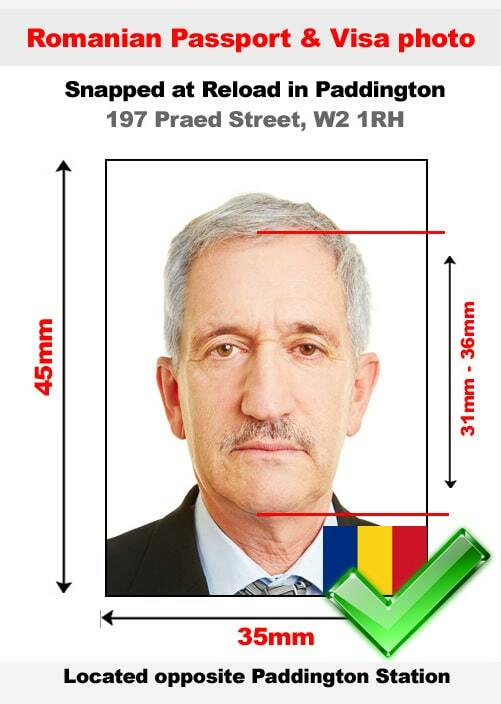 And of course your Romanian passport photo or visa photo will meet all of the necessary requirements stated by the Embassy of Romania. Our professional photographer will ensure your photos are up to standard and then will print them off for you right there and then. All you have to do is write your name on the back of each one, and then include the necessary amount with your application. Photos must be taken against a white or off-white background. Please wear dark clothing when you come to have your photo taken, so that you are clearly visible against the background. We suggest that you remove your glasses, so that there is no glare or reflection on the lenses. If you do choose to keep them on, then no part of the frame can cover your eyes, and the lenses must be clear and non-tinted. You must maintain a neutral expression in the photo, with your mouth fully closed. All the photos need to be identical, and as recent as possible- no older than six months. They can be in black and white, but we recommend submitting them in colour. Photos cannot be digitally altered in any way – if they are found to be altered, then they will be rejected. Your head must remain level while the photo is being taken, and you must look directly into the camera. Your face must also be straight towards the camera. You may wear headwear for religious and medical reasons, but it must not cover any part of your face from top to bottom or ear to ear. Your facial features must be clearly visible. If you come to Reload Internet for your Romanian passport photo or visa photo, we guarantee that it will pass with your application first time round, which means that you can cut out any possibility of your application being rejected due to a photograph error. We receive all of our specifications directly from the Embassy of Romania’s guidelines on passport and visa photographs, which can be found here.